We are a small, friendly and trustworthy business established 1989 in Swansea. We specialize in pebble dashing and skimming, although we carry out all aspects of plastering, more importantly we take pride in our work and do it ourselves unlike some companies that pass work onto sub contractors. We have build en excellent reputation for all our plastering services and come highly recommended. We are based in Swansea and also offer our services in South Wales for example Neath, Port Talbot and Llanelli. Our tradesmen are all highly qualified and we provide references on request. We offer business hours to suit your needs for example on weekends and evenings. Our rates our very competitive and we are fully insured. Contact us now for a free quote for all your plastering work. "Kevin is a very skilled craftsman who executes his work to an exceptionally high standard. He recently rendered our house and it was a pleasure to have him and his mate James here. Kevin carries out the job with courtesy and thoroughness and never leaves the job until it is finished, despite the many other jobs waiting for his attention. People passing the house constantly stopped to admire his work and he was asked for several quotes whilst here. We have asked him to come and do some plastering in the house as we were so pleased with the job and miss having them around! I thoroughly recommend Kevin as we were totally satisfied with his work"
"Great job rendering external walls of my house, getting them back to skim my lounge, highly recommend them"
"Kevin and his boys did a lovely job, clean and tidy, would recommend them to anyone"
Skimming is a plastering technique that can be used on new plasterboard or existing walls and ceilings to create a smooth finish as a base for painting or wall papering. K Evans plastering has over 25 years in plastering skimming services in Swansea, Neath and Llanelli. 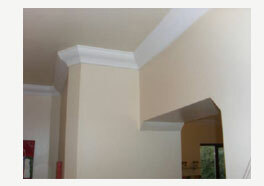 We provide high quality plastering skimming finish to provide a base for your decorative painting or wall paper. Contact us for a free quote for all your skimming plastering services. Pebble dashing can transform your outside walls. It is a cost effective way to cover your old brickwork or breeze blocks and can transform the way your property looks. This type of plastering is called pebble dashing as pebbles are dashed onto the render topcoat so that they stick before it dries and provide a weatherproof surface. At K Evans Plastering we are experts in pebble dashing and will provide you with a quality finish and excellent service. We can provide any colour or sort pebble dashing to transform your house and protect it from the elements. Contact us for a free quote for all your pebble dashing in Swansea, Neath, Port Talbot and Llanelli.